A progression from the original 'Debut'. 'Love You Diva' features a column of red and pink gemstones. 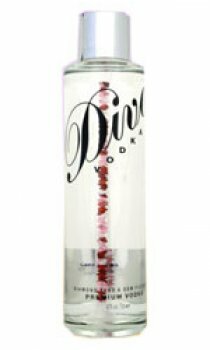 Diva, gem-filtered vodka is an exceptionally smooth, wheat-based ultra-premium spirit of style and substance. Diva is triple distilled and filtered through Nordic birch charcoal, then filtered through a dense column of gems including diamonds, rubies, emeralds and for a final polish before bottling. No two bottles are alike, with a removable column of crystals which tumble out on removal of the top stopper but are safely in the bottle during pouring. The gems may be used as a drink garnish and decoration. The 48 crystals in each bottle, selected by a Hatton Garden specialist, include cubic zircona, Scottish smoky topaz, pink tourmaline, sky blue topaz, London blue topaz, amethyst, citrine and Peridot. The crystals in each botle are hand-prepared by people in the Shetland Isles, Scotland with each person filling the crystals has a favourite colour and puts this at the bottom of each column so each bottle is trackable to the individual. The producer, Blackwoods Distillers also offers a bespoke service where you can choose the range of jewels to go in the coloumn as a totally unique gift. Jewels chosen may be rubies, diamonds, emeralds, topaz and the rare alenandrite or similar. Prices are available on request with all gems selected by the highly experienced expert, Bill Stead, London's jewel and diamond centre of Hatton Garden.